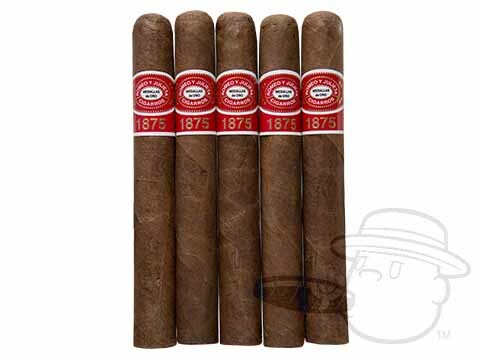 The Romeo Y Julieta 1875 Churchill is tagged with free shipping. If you order this product, your entire order will receive FREE BCP Ship Saver shipping! flavors of aged cedar, nuts, coffee, and spice for a well-balanced, creamy smoke that you'll want to savor time and time again. Great cigar but I always find a couple in a box that are VERY hard to draw. Even using a cigar poker doesn't always help. Tried both the natural and the maduras, find the natural more mild. Both are great depending on your mood. A glass of cabernet tops off the experience. A churchill makes the experience last longer. This is my favorite smoke with a little scotch, a good book or with just nothing except my lighter. It is 99.9 % going to burn even and stay cool. I can not say that about most others that I have smoke. My favorite "go-to" blend. BCP continues to be prompt and professional. Time and again going through my box, my first choice is always the R&J Churchill. I have grown to depend on it's consistent quality box after box. No surprises here. One of the best sellers we carry. Customers say very good cigar at an excellent price! The cigars were great, so I ordered a box. A good, solid cigar - this is my default cigar and it's always a good smoke. These are my favorite cigars for morning or when I share cigars when I would like to ensure I preserve my pallet before a meal. Wonderful, somewhat mild and complex. Like a good Pinot Noir. great cigar for the price and nice prompt delivery!!! This has become a favorite of mine. The cigar is consistently well made and draws nicely. It me it has a slightly spicy taste with definite cedar highlights. I smoke the Churchill and rarely smoke the entire cigar in the winter. I appreciate the fact that it still is flavorful after re-lighting. Great cigar with a smooth smoke. Very flavorful with Excellent Burn! Been smoking these for better than 5 years now. Every time I try something new, I always come back to these. Smooth, tasty, slow burning, but most important is their consistancy. Cigars were very fresh and the order came quickly. Love the product and the freshness from Best Cigar. I have been smoking these cigars for over 20 years. Obviously I find them to be a superior cigar i every respect, taste, draw, firmness. Recently I bought a box of churchill competitors and regret it, Will buy Romeo y Julieta with my next purchase. Romeo Y Julieta is definately a great tasting cigar.It is mild and even burning. Even though the cigar prices have gone up over the last several months, it is still a good buy for the quality you receive. Has become my favorite cigar and I appreciate the ability to purchase on a single cigar basis. good cigar , but not affordable for me. In ten years of purchasing cigars from Best Cigar Prices these cigars were undoubtably the WORST I have ever received. Been smoking these for years. Love ‘em! Romeo Y Julieta 1875 Churchill is rated 4 out of 5 based on 42 customer ratings. Do these cigars come individually wrapped. The cigars mentioned are definitely all individually in cello. im looking for romeo and julieta 1875 churchill,s either 2 25 boxes or 1 50 box. do you have them n what is the pricing. thanks, Jim. 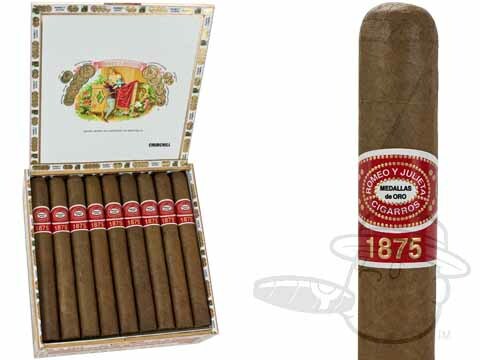 The Romeo y Julieta 1875 Churchill comes in a box of 25 for $89.95. We also carry the Romeo y Julieta 1875 Churchill en Tubos (which come in individual tubes) in a chest of 48 for $199.95.